We’d love your help. 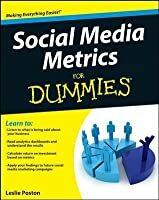 Let us know what’s wrong with this preview of Social Media Metrics for Dummies by Leslie Poston. Discover how to gauge your online success based on social media metrics With so many social media monitoring and measurement tools available, it can be overwhelming to figure out which tool is right for you when it comes to calculating the success of your social media marketing efforts. This fun and friendly guide helps you determine which tool will serve you best for unde Discover how to gauge your online success based on social media metrics With so many social media monitoring and measurement tools available, it can be overwhelming to figure out which tool is right for you when it comes to calculating the success of your social media marketing efforts. This fun and friendly guide helps you determine which tool will serve you best for understanding your online audience. You'll learn to sift through all the information available about social media monitoring and metrics so that you can listen to what is being said about your business, read your analytic dashboard, understand what metrics mean for you, calculate your return on investment (ROI), and apply your findings to future social media marketing campaigns. 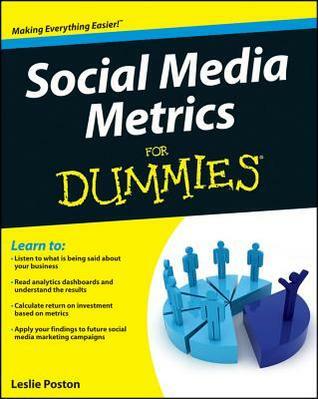 To ask other readers questions about Social Media Metrics for Dummies, please sign up. Before I begin to gush about this book, I need to talk about the For Dummies series I received this book through a GoodReads First Reads giveaway. The book WAS over my head in some ways and is aimed more at a business that has customers and money to spend on analytics programs but that doesn’t mean I didn’t come away with good information. I just had to dodge in b As an analytical person, statistics and analytics interests me on almost any subject. 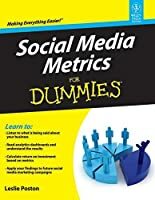 I was intrigued when I was offered a chance to read Social Media Metrics for Dummies because I was in the midst of using social media more for blog promotion and I wanted to know how I was doing. There is of course also services like facebook insights which give you data concerning your product page and most social networks have something similiar. Sites like twitter let you advertise your account for more followers or promote a hash tag both of which are paid services. Twitter apparently has been charging quite a lot for these services and are in the process of introducing cheaper services along the lines of google adsense to make them more competitive. I assume it will be like pay per click rather than a flat rate. I really enjoyed reading this book and it has a lot of useful information. Hard to review since I wrote it ;) Hope you all enjoy it and find it helpful.